There is another bottle that is almost identical to this one in choice of material, height, shape, handles, small mouth, and hollowing (which is excellent in the upper reaches of the bottle but leaves a heavy foot—6 cm deep in this case, 8 cm in the other). It is illustrated in Franz 2010 p. 131, no. 421. The main differences are that the second bottle has no name incised on the foot and it has a thin upper neck rim. Both must be from the same workshop at the same time, and probably from the same piece of yellow-green jade which has some very fine, paler flecking in it. Features which allow a tentative attribution to the palace workshops are the distinctive hollowing, the small, superbly carved mask handles with circular and rather realistically detailed heads and perfectly round rings, the material, which was obviously a favourite of the Qianlong emperor, and the lipped upper neck on the other example. Although this lip is thinner than normal for the palace group, it is such an unusual feature on an otherwise standard cylindrical neck on a largely plain form that is likely to have occurred only in a workshop that was used to adding such a detail. The colour of the material here is delightful and, on one side, quite flawless. The other side has tiny flecks of paler colour that give it a very slightly textured effect when examined closely. 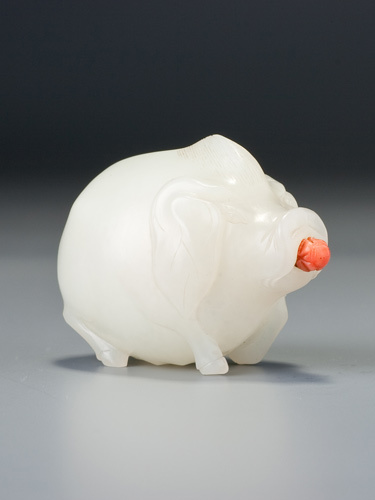 Like Sale 2, lot 127, the colour is closer to a real yellow than many so-called ‘yellow’ jade bottles, and what little carving there is reveals a lapidary of consummate skill. The name that is neatly incised in regular script under the foot raises the intriguing question of what it is doing there if the bottle is Imperial. The first step is to verify that this actually is a name, and it appears that this is the case. The name Shen Kan appears in a collector’s seal on a few paintings attributed to Ming painters. He may be Ming or Qing; nothing is known of him. A Shen Kan also appears as the husband of a virtuous woman in an entry for 1573 in the Veritable Records of the Ming, but that was a pre-snuff age, of course. 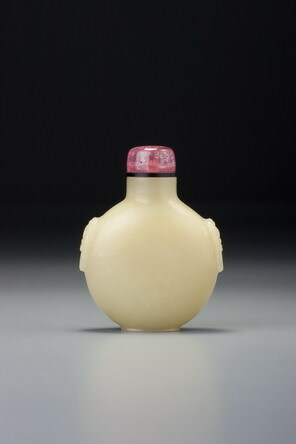 In any case, it is extremely rare to see an ordinary person’s name on an Imperial bottle, whether it be the name of the maker, a patron, a recipient of the bottle as a gift, or a collector.